The MIND diet was developed at Rush University Medical Center in Chicago with the goal of protecting and strengthening the brain. 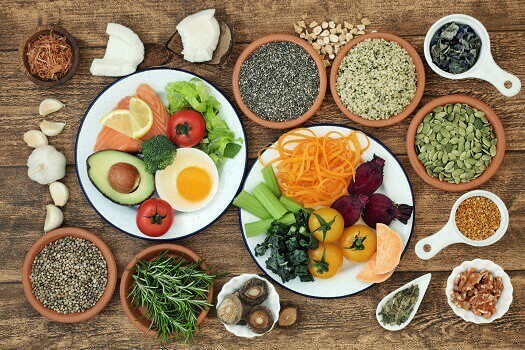 This diet doesn’t have a lot of set guidelines, but it’s similar to the Mediterranean and DASH diets, encouraging people to eat a diet high in whole grains, vegetables, berries, nuts, fish, beans, olive oil, and poultry while avoiding excessive amounts of red meat, saturated fats, and sugar. Seniors who try out the MIND diet get to enjoy these five advantages. One of the biggest benefits of the MIND diet is that it reduces the overall risk of getting dementia. It isn’t possible to entirely prevent dementia, but the diet can at least address some of the lifestyle factors that increase the condition’s severity. A 2015 study monitored more than 900 seniors and found that following the MIND diet led to a 53 percent lower risk of developing Alzheimer’s disease. A professional caregiver with training in nutrition can be a wonderful source of information and encouragement as your loved one adopts new healthy habits, including eating more nutritious foods. Maintaining a high quality of life can be challenging for some seniors, but professional caregivers can help them obtain this goal. Families can trust Portland elderly home care experts to help their elderly loved ones focus on lifestyle choices that increase the chances of living a longer and healthier life. Though the main goal of this diet isn’t weight loss, losing weight can be a beneficial side effect of following the MIND diet. Not every person on the diet loses weight, but it does make it a little easier to prevent obesity. The reason the MIND diet is linked to weight loss is because it encourages people to eat foods low in calories, such as fish and vegetables, while discouraging the consumption of empty calories in the form of saturated fats, sugars, and processed foods. One of the main reasons the MIND diet helps with dementia is because it enhances the circulatory system. The reduction in saturated fats and processed foods lowers blood cholesterol and blood pressure. In addition to making sure the brain gets plenty of oxygen-rich blood, following the MIND diet can also lower the risk for heart attacks and other cardiovascular issues. While caring for a loved one is rewarding, family caregivers need to maintain a healthy lifestyle too, which involves self-care and making time to attend to their own wellbeing. In Portland, respite care is a great help to many families. Caring for a senior loved one can be overwhelming at times, which puts family caregivers at risk for burnout. However, an in-home caregiver can take over your loved one’s care, allowing you the time you need to focus on your own health, maintain a full-time job, or care for other members of your family. Oxidative damage occurs when the cells of the body are damaged by free radicals, a toxic byproduct of oxygen reacting with other molecules. This damage is linked to a variety of issues, ranging from increased cancer rates to heightened joint pain. One of the only effective ways to reduce oxidative damage is by consuming antioxidants. These compounds are found in the fresh fruits and vegetables required by the MIND diet, and they neutralize free radicals before oxidative damage occurs. Inflammation is supposed to occur when the body encounters a foreign invader—heightened body temperature and increased blood flow fight off bacteria. However, chronically high inflammation can be an issue because it increases stress levels in the body and may lead to a variety of other illnesses. The MIND diet reduces inflammation because it contains high levels of antioxidants and omega-3 fatty acids. A professional caregiver can provide additional support for your loved one’s efforts to adopt a healthier way of eating. Not every senior has the same care needs, which means they don’t all need the same type of at-home care. Portland, ME, families can rely on Home Care Assistance to provide individualized care plans to meet your elderly loved one’s unique care needs. Our holistic Balanced Care Method was designed to help seniors focus on healthy lifestyle habits such as eating nutritious foods, exercising regularly, and maintaining strong social ties, and our Cognitive Therapeutics Method offers mentally stimulating activities that can stave off cognitive decline and delay the onset of dementia. Trust your loved one’s care to the professionals at Home Care Assistance. Reach out to one of our compassionate Care Managers today at (207) 835-4849.